Yes, durian! 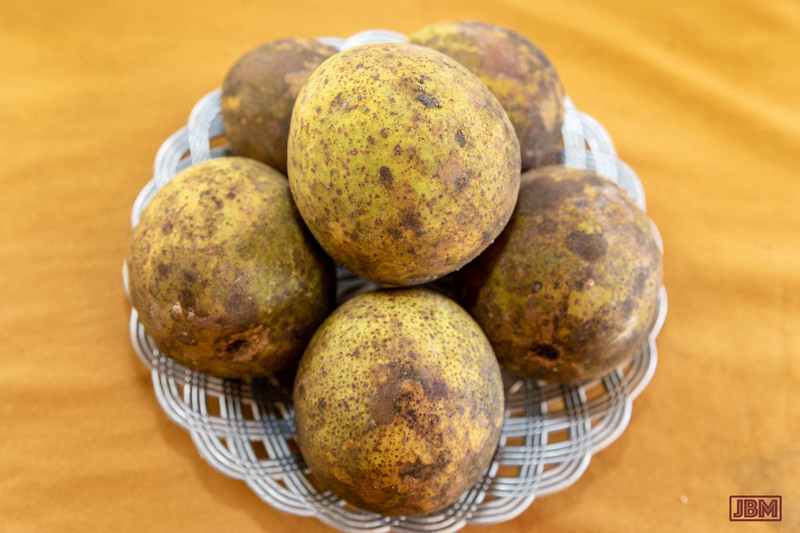 Loved by many as the Raja Buah (the ‘King of Fruit’), and reviled by others as stinky and disgusting. I’m a durian lover, and can’t comprehend those who aren’t. Perhaps it’s a genetically determined hypersensitivity? 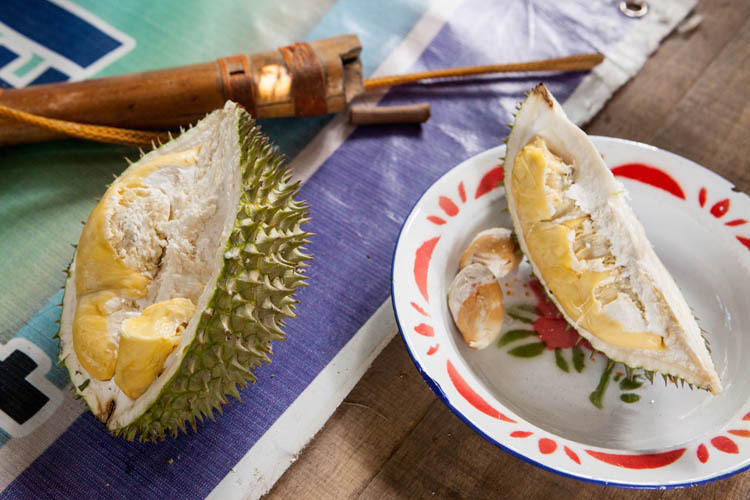 There are around 30 species of durian, at least nine of which are considered to be edible. 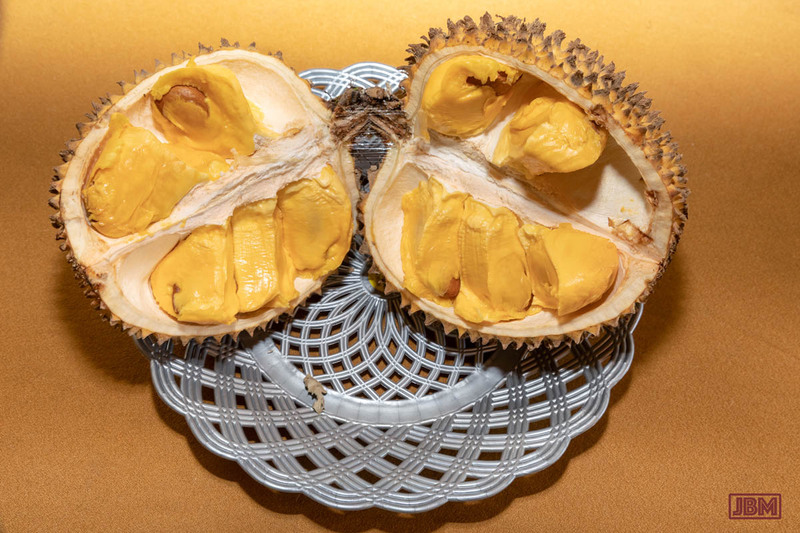 The durian genus is native to the islands of Borneo and Sumatra, with many growing wild here, and referred to as durian hutan (‘forest durian’). 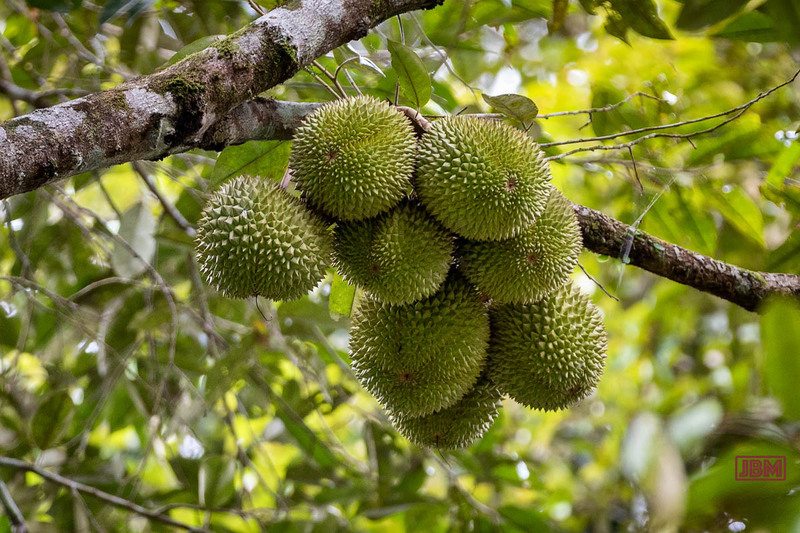 LOTS of edible durian are produced in Kalimantan. Some of the best ones grow along the middle reaches of the Katingan River in Central Kalimantan, upstream from the town of Kasongan. 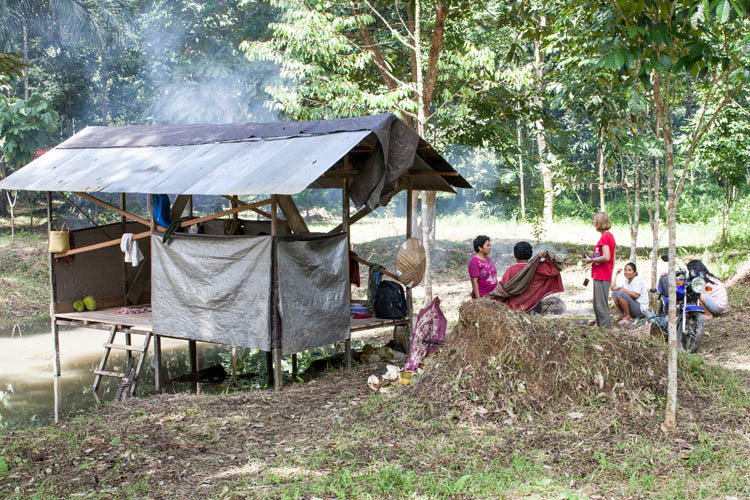 Our favourite Dayak Ngaju village of Tewang Rangkang sits right in the middle of that zone. We were delighted to return there last month for a short stay during harvest season. In Tewang Rangkang (as in almost all Dayak villages), the houses line up in a row along the riverbank. Behind the houses are areas where chickens and pigs are kept, and areas (often quite extensive) of fruit trees – especially durian. Further away (and across the river) are areas used for ladang dry rice cultivation. There are no fences around the individual durian orchards, but everyone knows exactly who owns which trees. 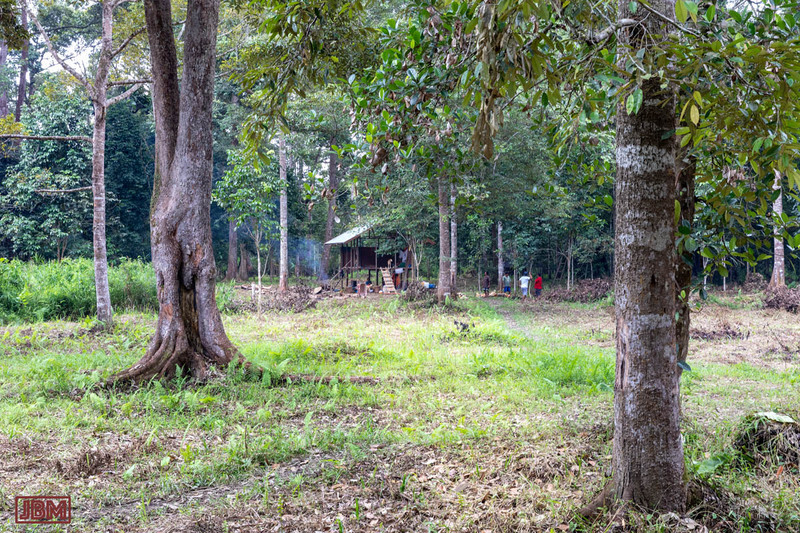 Each orchard is marked by a the presence of a pondok (hut), further asserting ownership. 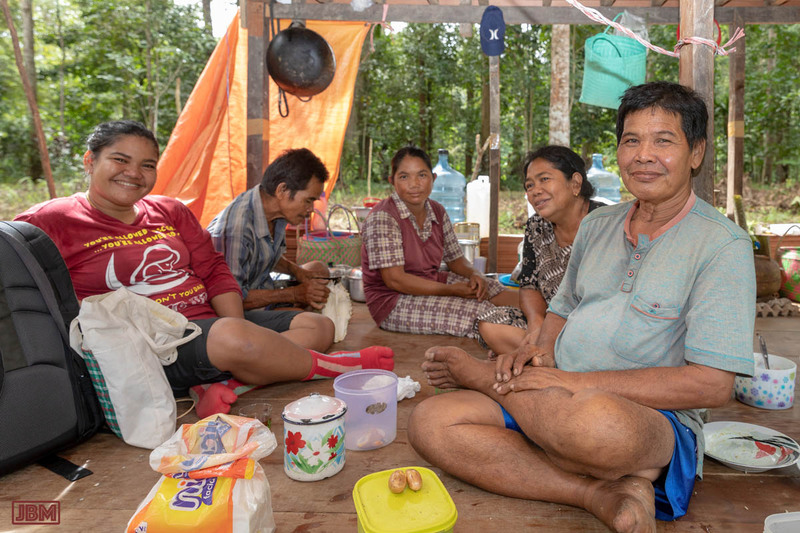 During harvest season (December – January) the pondoks are occupied day and night, with family members taking turns to stand guard over the orchard. Pak Dahuk and Ibu Wanie have built a new pondok since we were there in 2015. 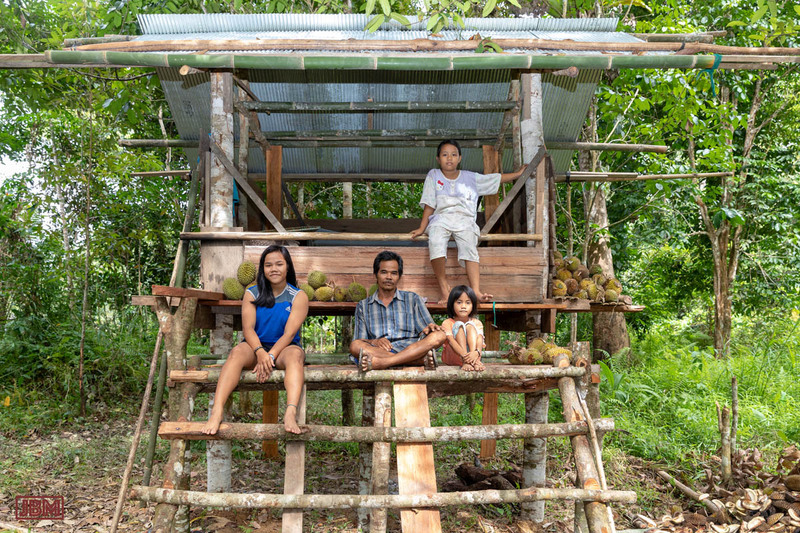 It’s a solid structure, with an even more solid roof, so that there is no risk of getting beaned by a falling durian. Not all pondoks are quite so grand. Some appear decidedly impermanent. And others, like Pak Etiu’s pondok, are somewhere in between. 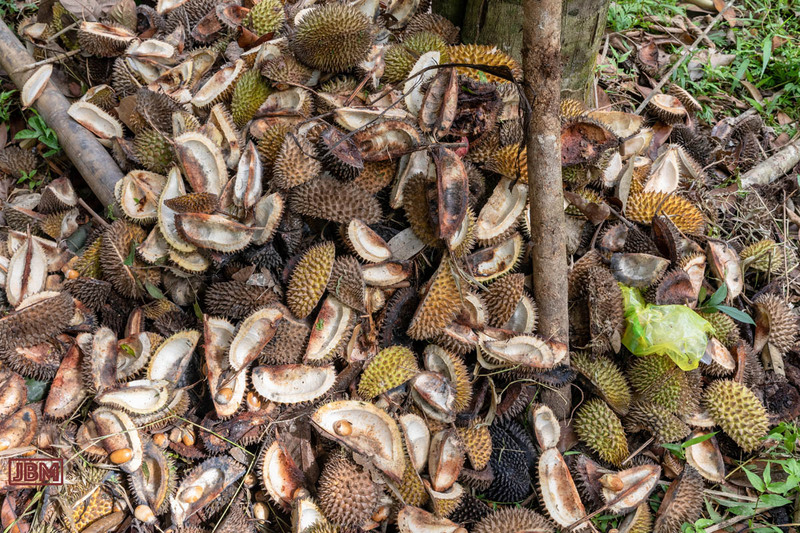 The stated intention of the pondoks is to protect the durian harvest from pilferers, because the fruit are quite valuable. But actually there is actually little or no theft, and we think that the villagers just enjoy a special time of year when a large proportion of the population ‘camps out’ in the forest, cooking and eating and sleeping under the trees, and visiting their friends and neighbours residing in neighbouring pondoks. 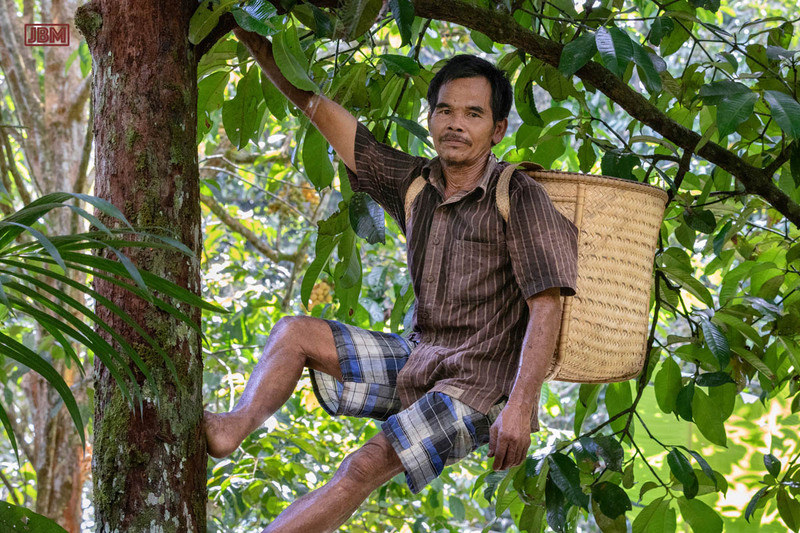 And collecting the durian fruit as they fall to ground from the tall trees. A mature durian fruit can weigh three kilos, and the rind is covered with characteristic hard sharp spikes. The word duri actually means ‘thorn’. 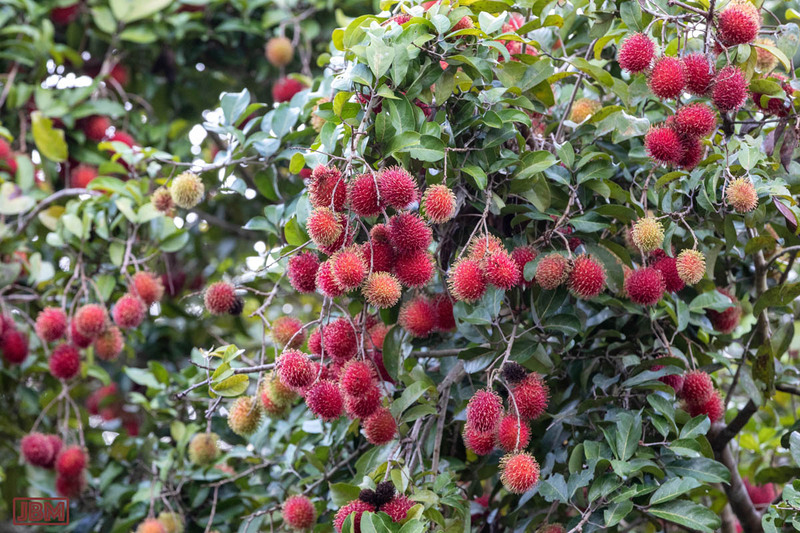 A fruit falling tens of metres onto one’s head could potentially be fatal. 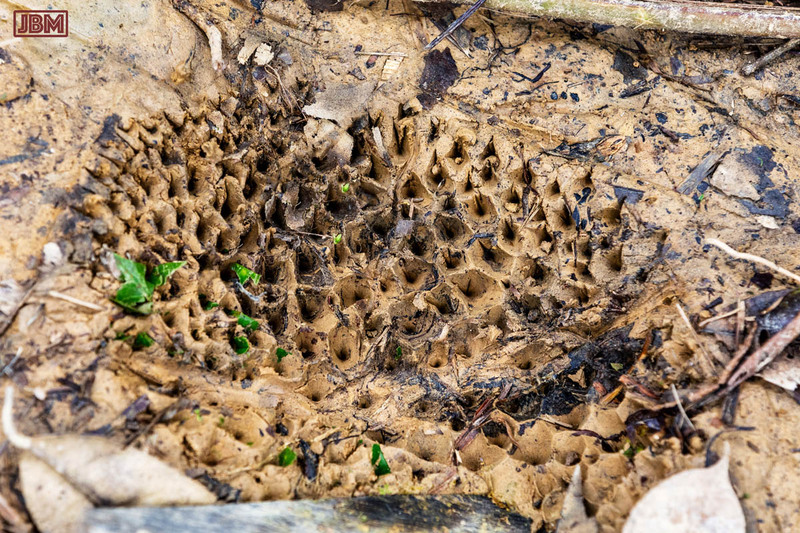 Even the ground gets scarred by the impact of falling fruit. 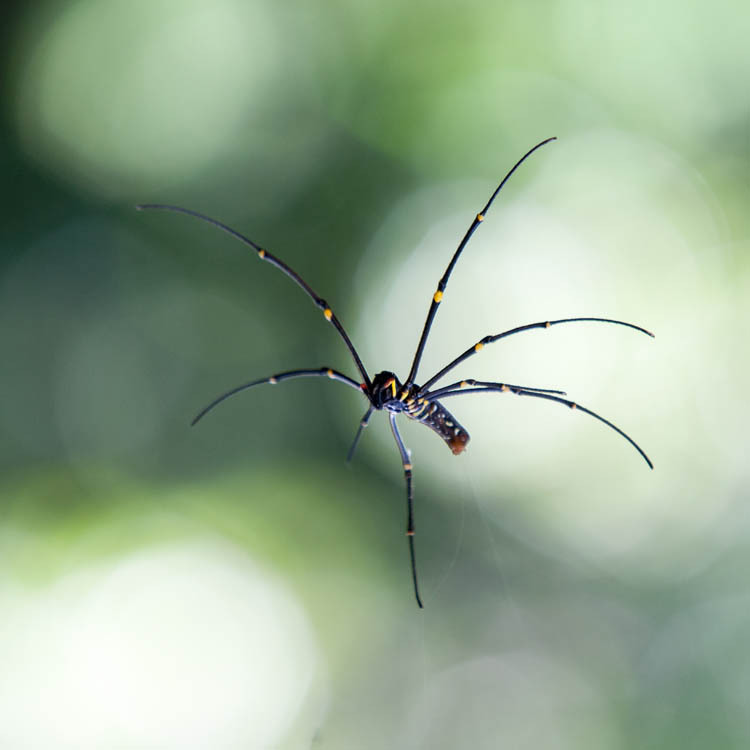 I had one land a couple of metres away from me, with no warning but a colossal thump – and so I quickly retreated back under the shelter of the pondok roof. 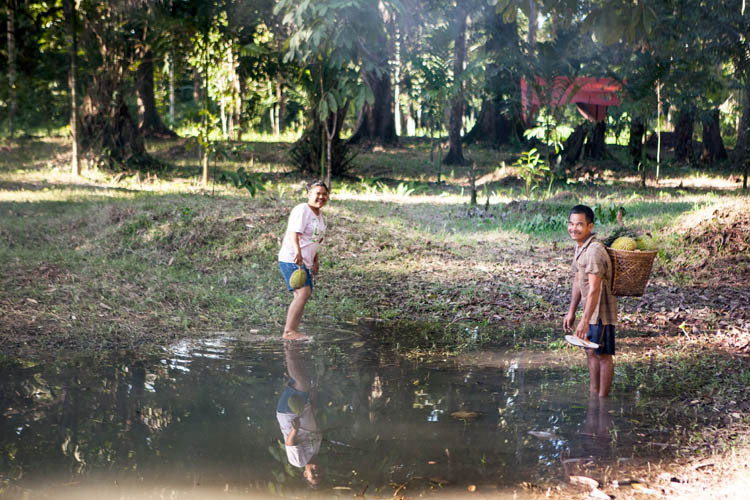 Apart from collecting fruit and socialising, there’s work to do out in the pondok. 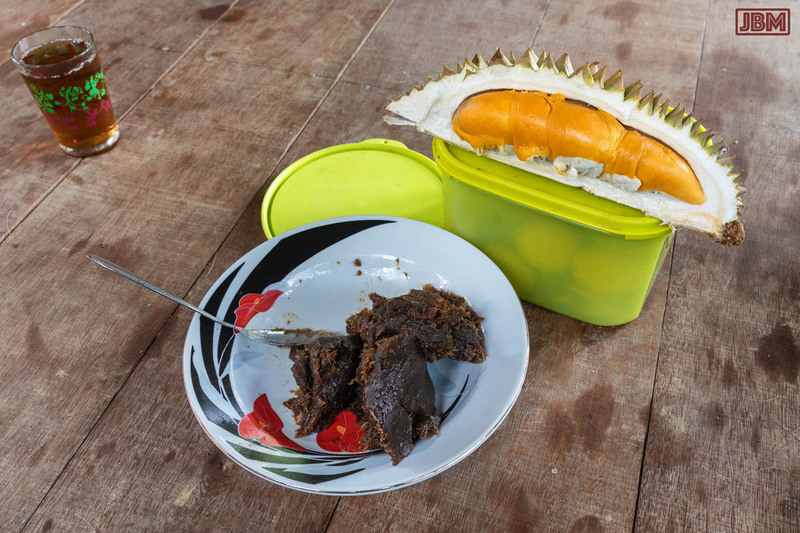 Led by Ibu Wanie, everyone helps to prepare large quantities of dodol durian – for consumption, gifts and sale. 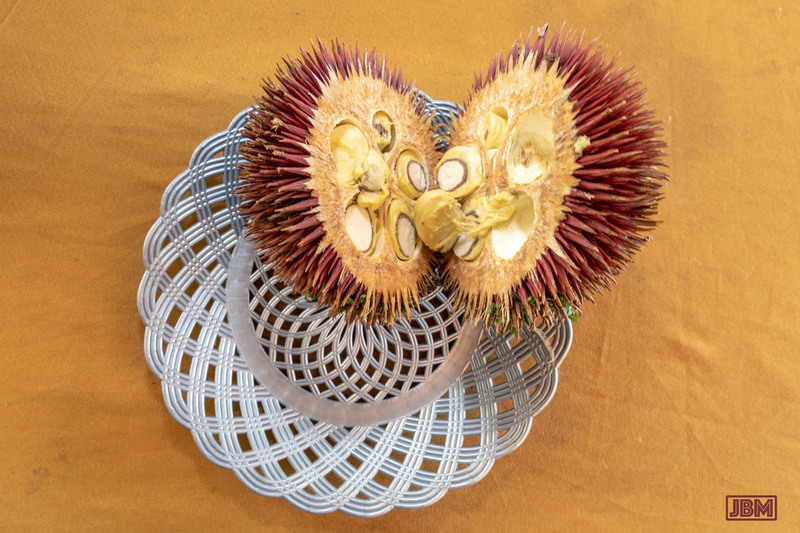 The durian flesh is removed from dozens of fresh fruit, and cooked up in a very large pan over a slow fire along with coconut milk, glutinous riceflour and gula aren (palm sugar derived from the aren palm). After hours of simmering and near-continuous stirring, a thick dark red-brown fudge-like paste is produced. It is delicious. After production of dodol durian, and quite a bit of feasting along the way, there is a large a growing pile of discarded durian husks. But it’s not just durian trees. The vegetation around many Dayak villages may at first glance appear to be secondary forest regrowth. But closer inspection reveals that almost every herb, shrub and tree has some productive value. So there are all sorts of fruit trees: bananas, papaya, langsat, mango, guava. 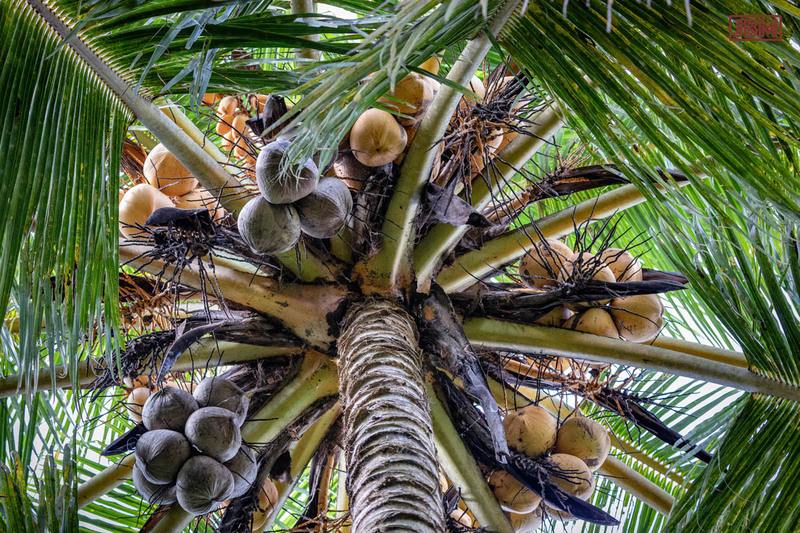 And of course many coconut palms. 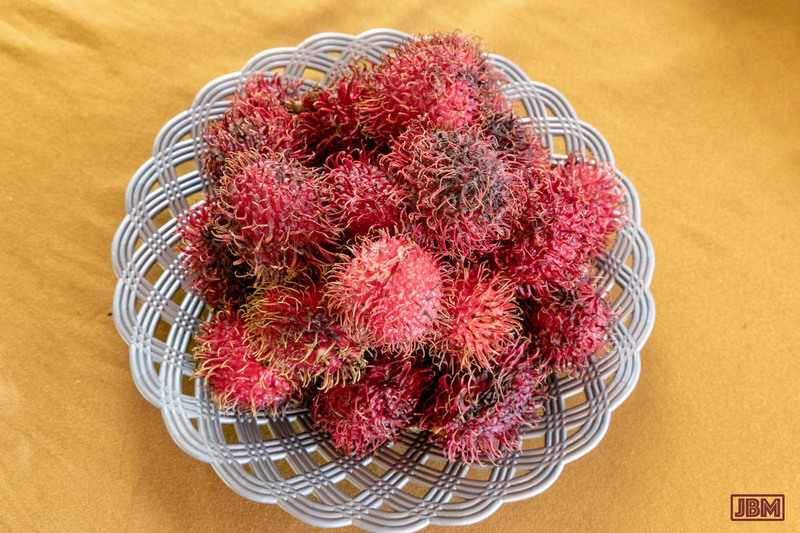 And rambutans – all in fruit at the same time as the durian. 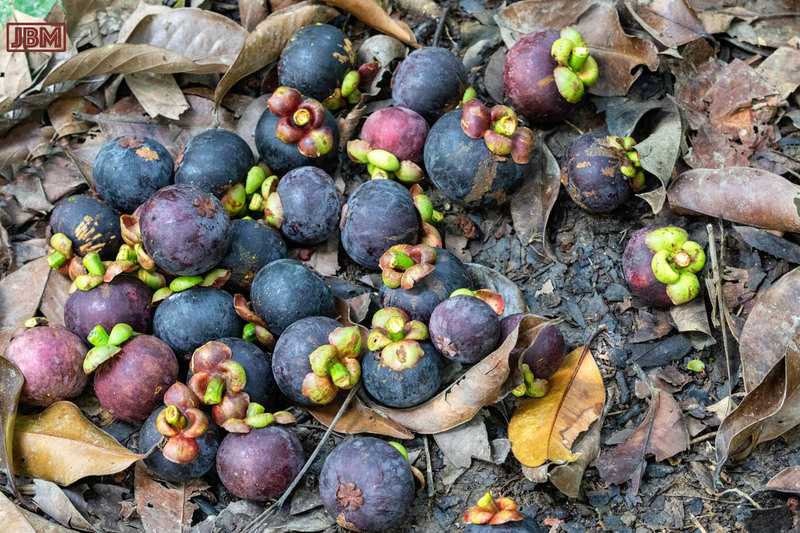 Pak Itiu shins up the mangosteen tree to collect fruit. And meanwhile, back at the pondok, there’s time for a group portrait. Tewang Rangkang is a Dayak Ngaju village which stretches along a couple of bends of the Katingan River. It’s about an hour’s drive north of Kasongan in Central Kalimantan. Since 2014 we have been frequent visitors. 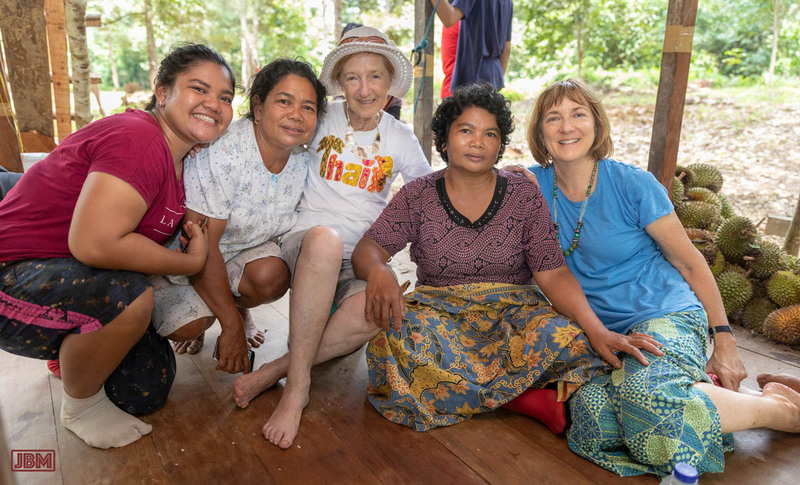 We’ve been privileged to stay there as guests of our wonderful Dayak Ngaju friends Mbak Lelie Liana, Pak Dahuk, Ibu Wanie Manur, Mbak Susi, Om Indra and Tante Hente – and their (very) extended families. Over those many visits we’ve witnessed manugal (communal rice planting) in 2014 and 2015, rice harvest, tiwah funeral ceremonies in 2014 and 2017, other family ceremonies – and durian harvest in 2015. The dry season has begun here, and the smoke has started to thicken from the countless fires across the island of Borneo (especially our part of it…!). Soon it’ll be mask-wearing time again. The smoke is likely to worsen from now until the wet season starts some time around November – though the forecasts for a doozy El Niño event suggest that this year’s rains may be delayed into 2016. Everyone looks forward to the arrival of the rain. 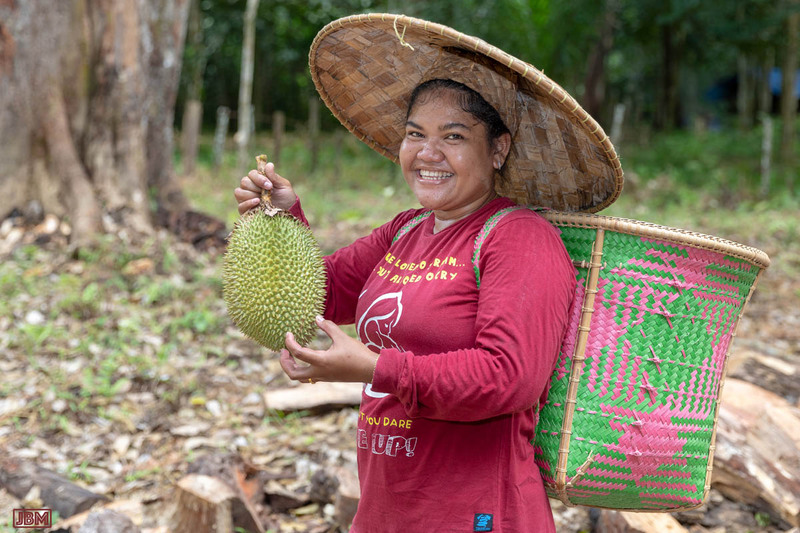 And the wet season is also keenly anticipated because it is … Durian Season! 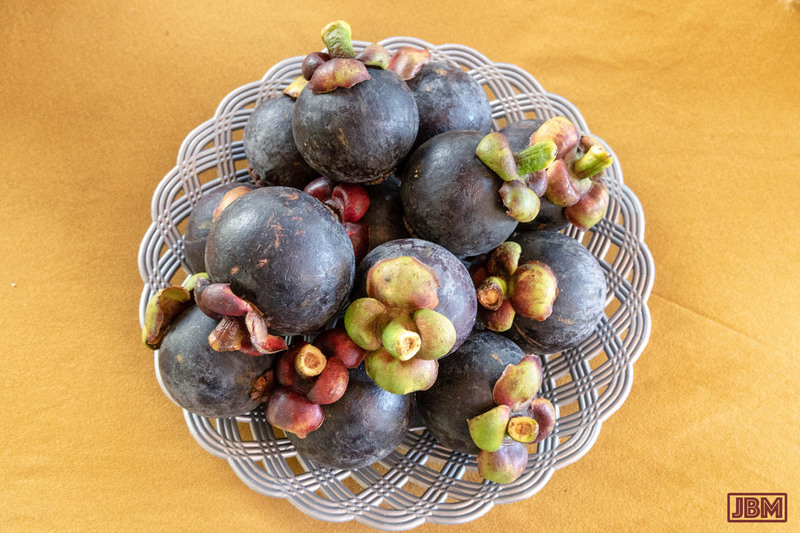 This fabulous odorous fruit is available here from December through to February. 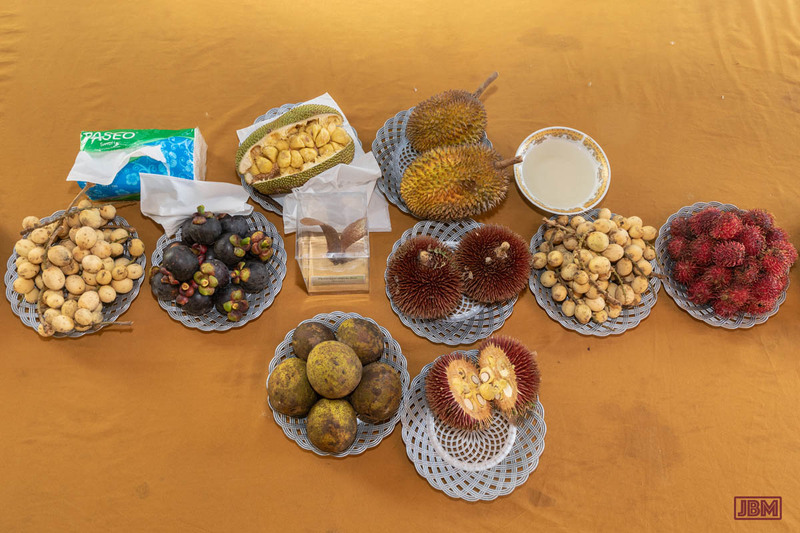 Regarded here as raja buah (the ‘king of fruits’), the segments of this 1-3kg fruit segments have custard-like flesh around the seeds (which are also edible). 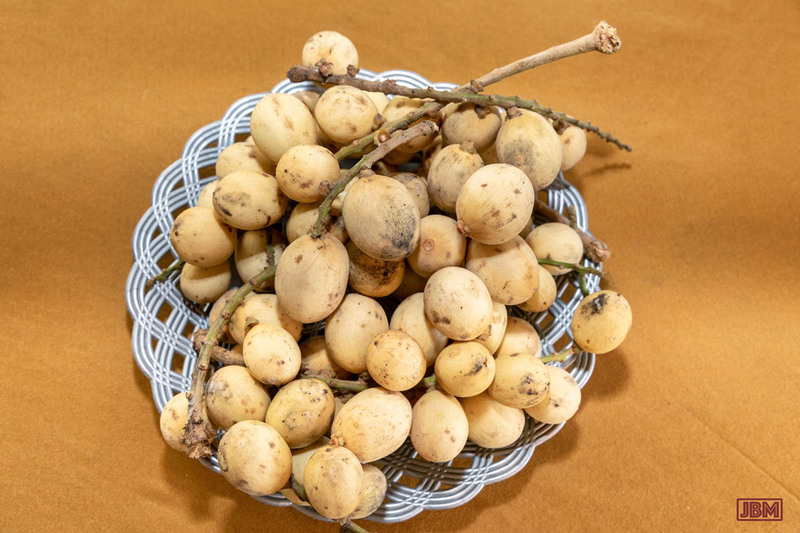 It’s delicious, and quite unlike any other fruit that we’ve tasted. 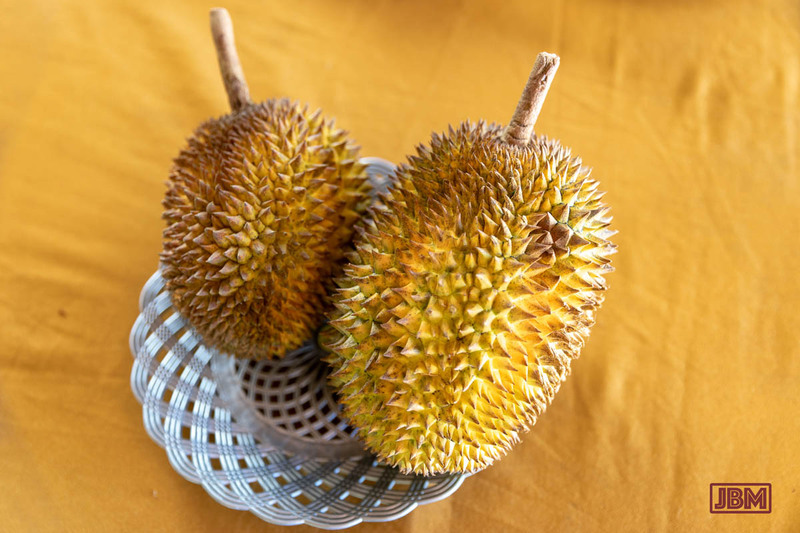 It also smells a bit – well, a lot actually – even before the fruit is opened, and we often see signs at hotels and public transportation advising that possession of durian is prohibited. We like the smell (in moderation), though some people consider it repulsive. 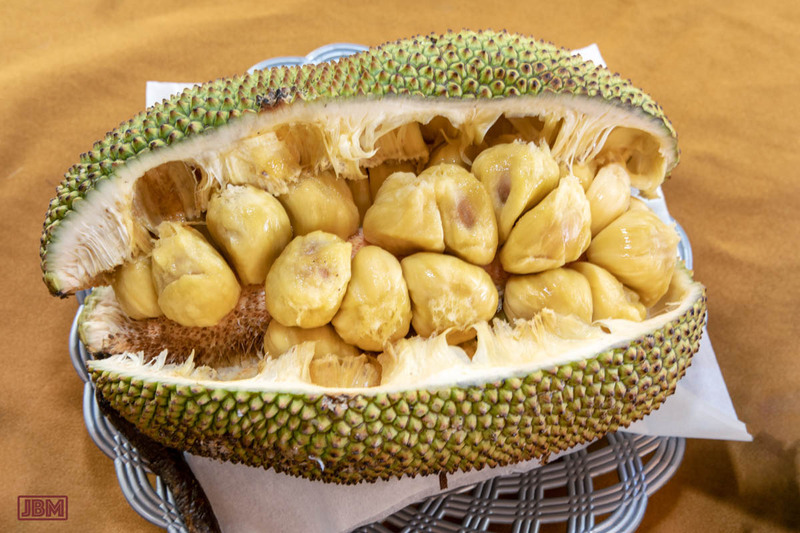 Having spent a couple of hours travelling a car with the back section stacked up with fresh durian fruit, we can confirm that the scent can be a little overpowering. 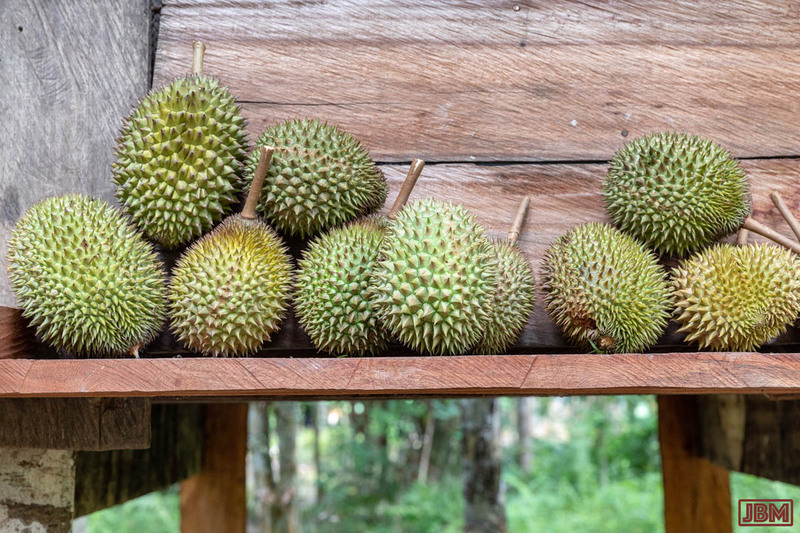 There is an Indonesian saying: Durian jatuh, sarong naik (“The durian falls and the sarong rises”), referring to the supposed aphrodisiacal qualities of the fruit, but we can’t directly confirm this to be true. 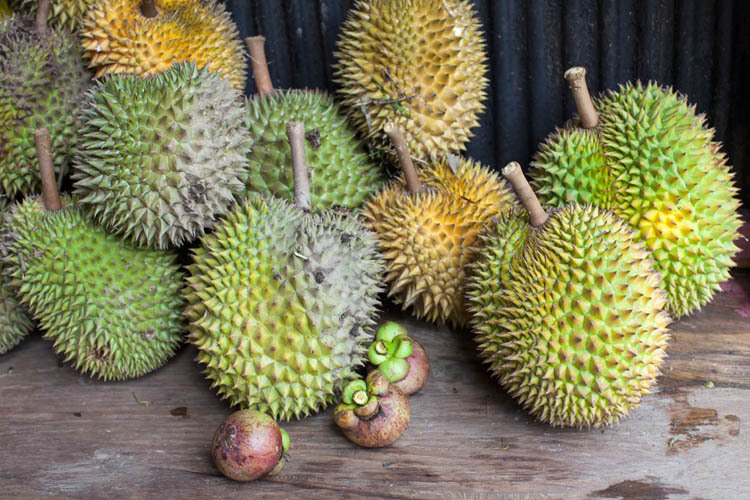 There are a number of different species of durian, at least nine of which are edible, and a large number of cultivars. They are all members of the Durio genus. The trees grow large, up to 25-50 metres depending on the species. 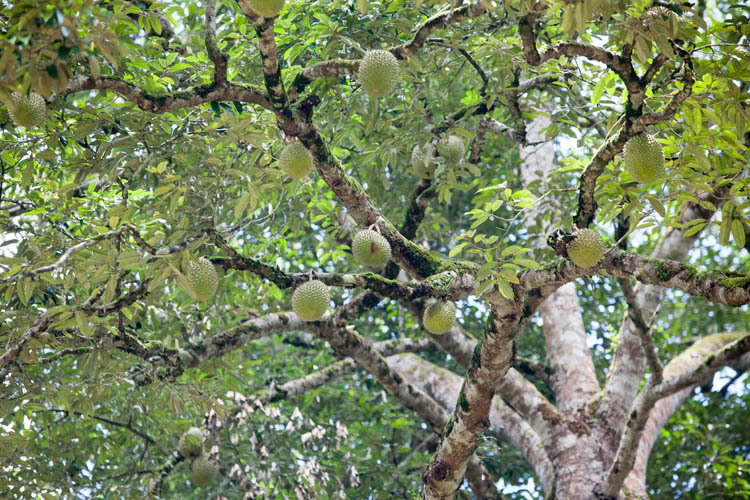 They all have thick hard skins (to survive falling from the trees when ripe), which are adorned with hard sharp spikes. In fact the word duri means ‘spike’ or ‘thorn’ in Indonesian (and Malay). 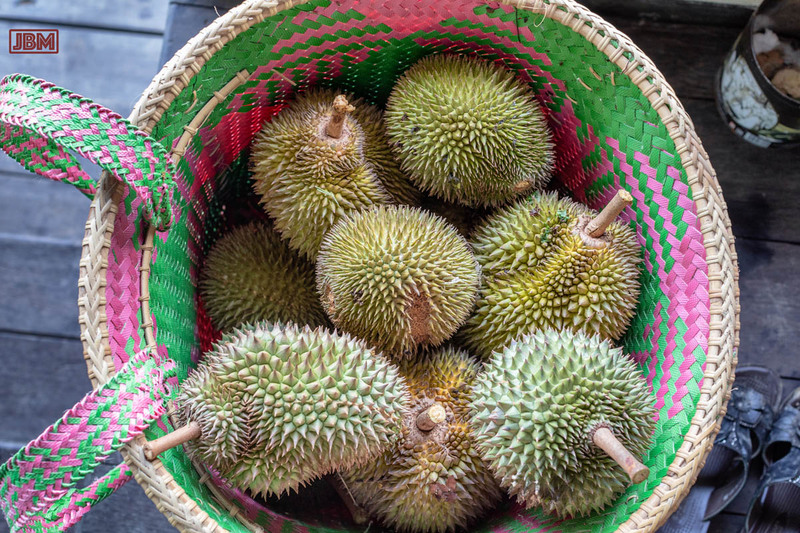 Durian from the Katingan River region to the north of Kasongan, about an hour to the west of where we live, are prized for their flavour, and are priced accordingly. 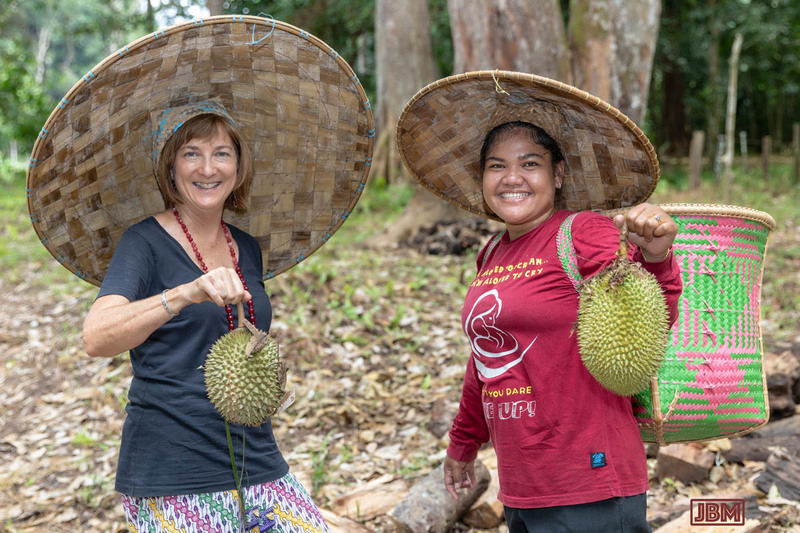 The village of Tewang Rangkang, which we have now visited several times with our friend Lelie, is right in the heart of the Katingan durian-growing region. There are numbers of the big trees in plots on the outskirts of the village, each plot belonging to a local family. 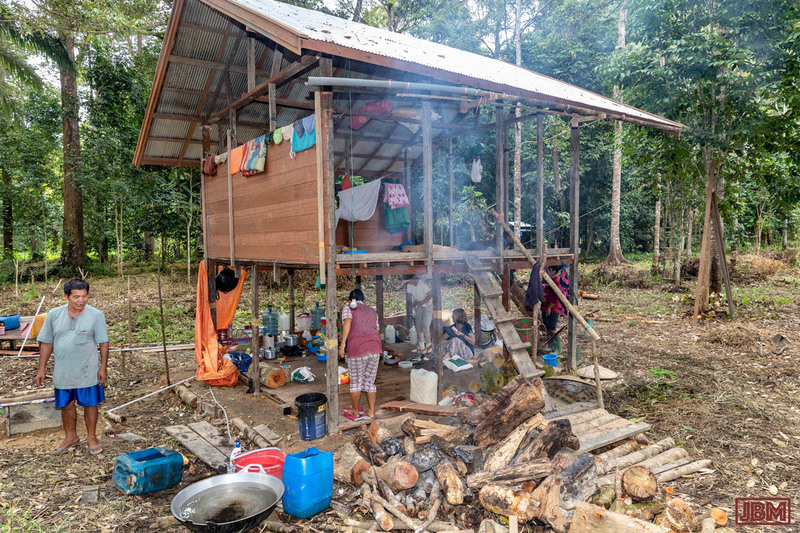 In each one there is a simple wood-and-tin shack/shelter (pondok). 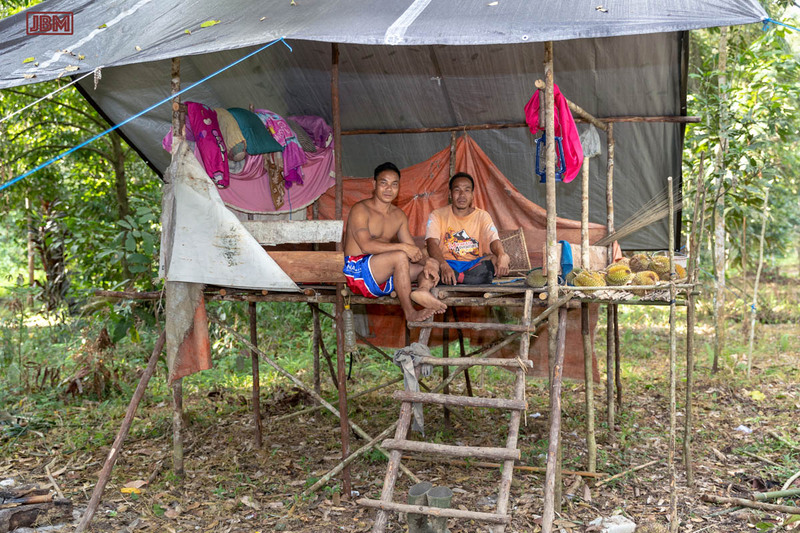 Throughout the fruit season, family members take turns to sleep overnight in the pondoks, to guard against thieves making off with the valuable fruit. 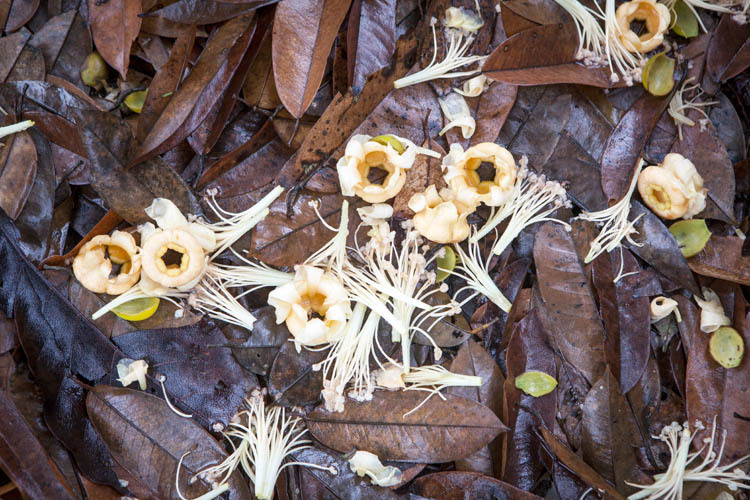 Durian trees flower in September – October, and the fruit are collected as they fall from the trees around three months later. The flowers of most Durian species are pollinated by bats. 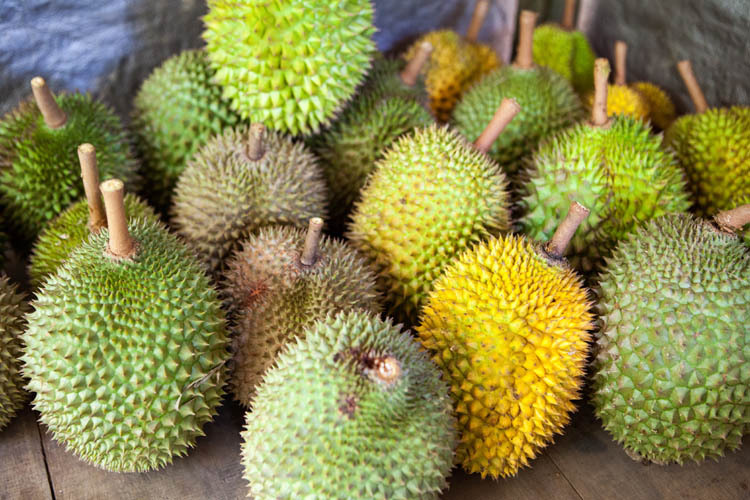 The ripe fruit fall to the ground with a bit of a whoosh and then a big thump when they land, making it easy to locate each new incoming Durian missile. While we were visiting, everyone made a game of racing to be first to get to the newly descended fruit. With Lelie and her sister Susi we dropped in to visit at a neighbouring pondok. 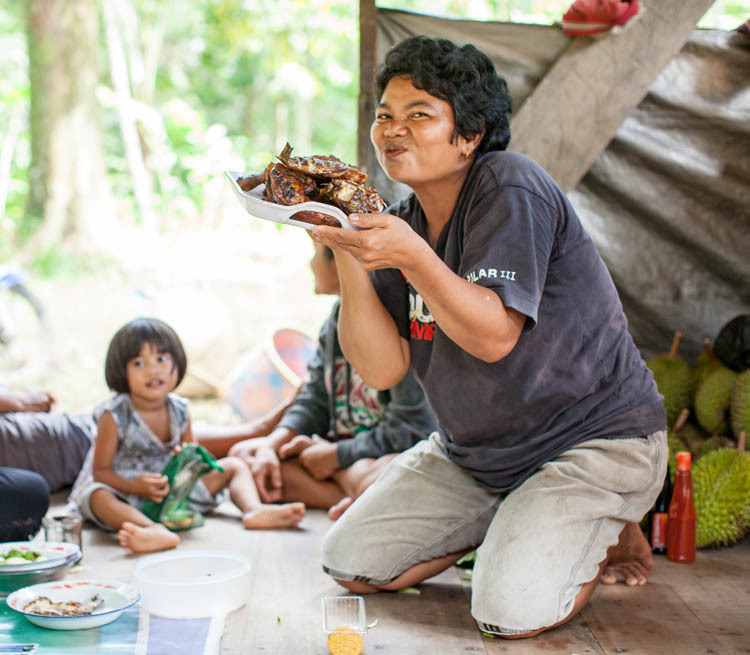 Ibu was preparing a meal of forest mushrooms, which she kindly shared with us. In her batik blouse, bathtowel cummerbund and leopard-skin tights, she displays a fashion sensibility of refreshing individuality. The mushrooms were delicious. 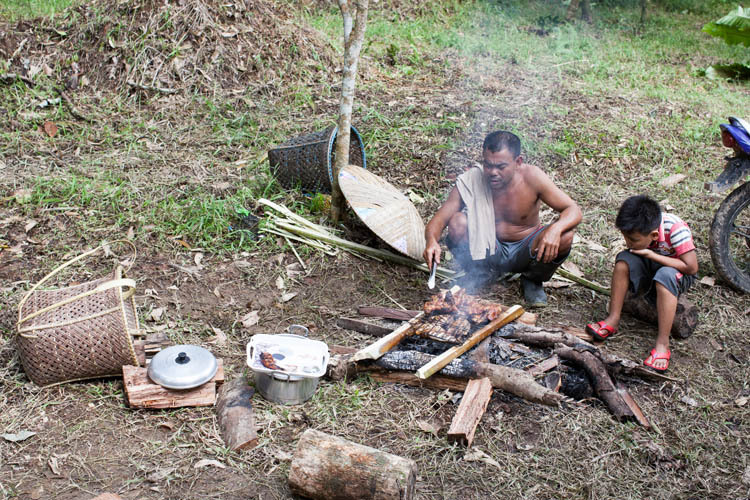 Back at Lelie’s family pondok, a barbecue was under way. 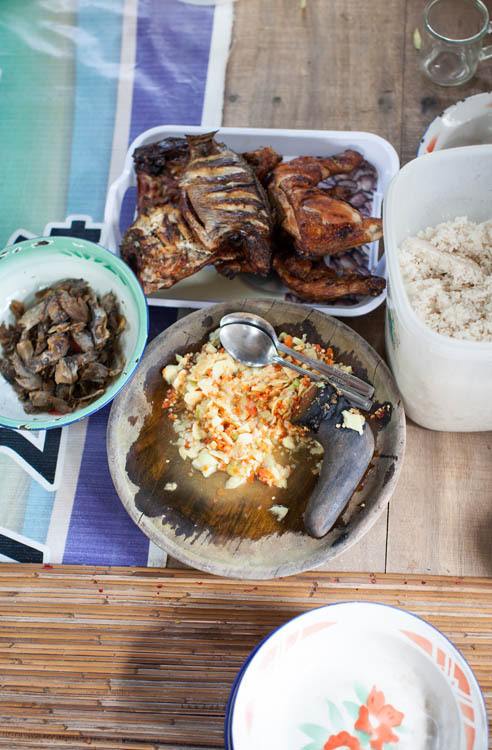 Fish caught in the Katingan River (some fresh, some dried and salted), local free range chicken (ayam kampung), and rice and veggies from the family’s ladang gardens. I think that the only purchased ingredient was salt. 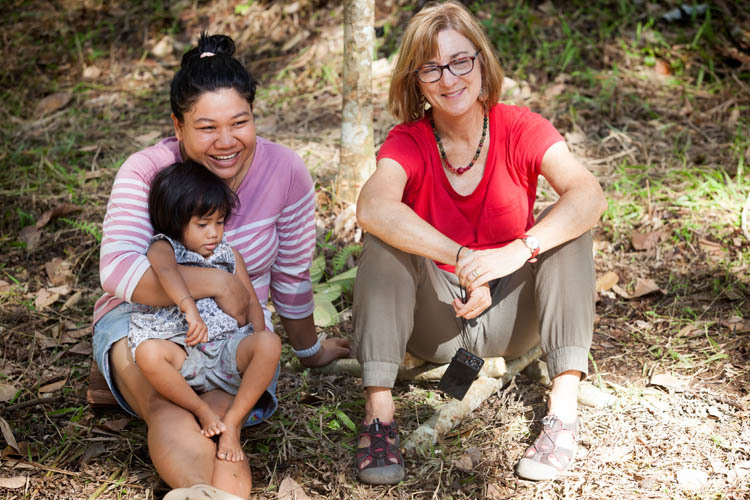 After lunch, Lelie, Karen and Enjel found a shady spot to relax – but it was NOT under a Durian tree. 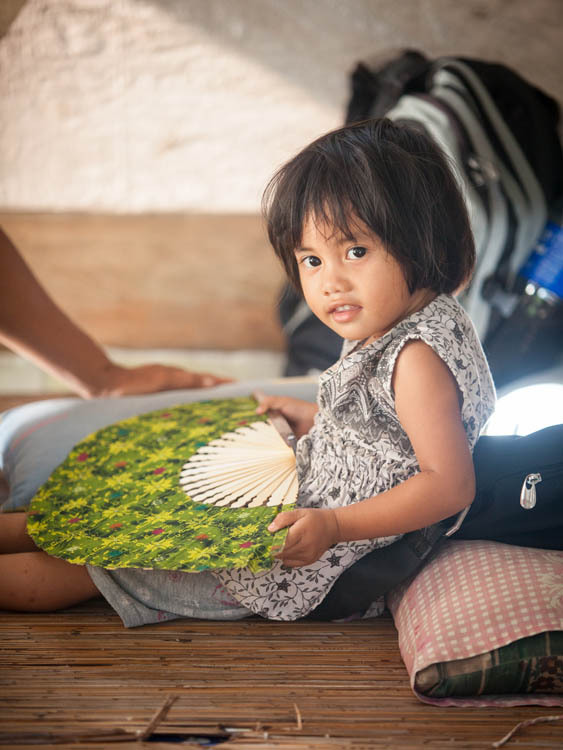 And Enjel borrowed her mum’s fan to keep cool – or to play with. As the day went on, the stockpile of Durian fruit grew larger and larger. And that’s how we came to be travelling in a car loaded up with fuming Durian when we returned home that evening.